Neil Walker lost his starting second base job to Gleyber Torres but when asked his opinion of the 21-year old top prospect of the Yankees he was full of praise. 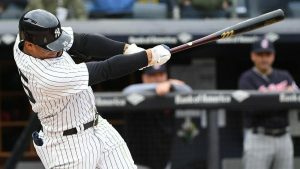 Walker said that Torres’ poise was very rare after he and Yankees fans watched the youngster hit a walk-off home run to beat the Cleveland Indians on Sunday 7-4. Walker added that Torres has stepped into the role and has taken off in an impressive fashion with it. Prior to the game, Yankees manager Aaron Boone said he was most impressed by the all-around player the Venezuelan native is without any specific aspect of his game wowing someone. Boone however was wowed by what Torres did on Sunday and added that it seems as if the bigger the moment or the bigger the situation, the better Torres is. Commenting on how he did not flinch in that important moment and have an extended time at bat the way he did taking the count to 3-2 is a play for a mature veteran accomplished by someone who has only been in the league for two weeks. Torres is now the youngest ever Yankees player in franchise history to hit a walk-off homer at just 21 years and 144 days. Mickey Mantle the Yankees legend and Hall of Famer was the youngest prior to Sunday at 21 years and 184 days when he accomplished the feat in April of 1953. Torres is also the first position player in the major leagues since 1900 to start and be a winner in 14 of his first 15 games in the big leagues. He has 11 RBIs which tie him for the eighth most by any Yankee in the first 15 games of his career. Torres has a batting average of .327, two home runs, an on-base percentage of .357 in 52 at bats during his first 15 games, and mostly batting No. 9 in the batting order. Gary Sanchez, the young talented catcher for the Yankees said that everyone knows how much talent Gleyber has as it is no secret. Sanchez added he played early last season with Torres during spring training and even then at 20 he impressed the Yankees slugger. The heroics by Torres overshadowed another rookie with the Yankees Domingo German, who was taken out after 84 pitches, leaving with a no-hitter through six innings. Boone did not want to risk injury to his rookie pitcher. The Yankees continue to roll with their 15th win in 16 games and are just starting to hit the ball like everyone thought they would. President Trump Urging Automakers to Make Cars in U.S.